Admissions Open at Mehran University of Engineering & Technology, Jamshoro's Jamshoro, and Khairpur Campus for the batch Spring 2016. MUET offers admissions in different fields of study for Masters, and Phd. you can apply for , ME - Master of Engineering, MS - Master of Science, M.Phil - Master of Philosophy, Master, MSSE - MS Software Engineering, and MSIT - MS Information Technology, Phd - Doctor of Philosophy, Phd Computer Science. candidates seeking admissions in post-graduate programme at mehran university campus can get admissions in different disciplines in evening program. HEC scholarship awardees are encouraged to apply. 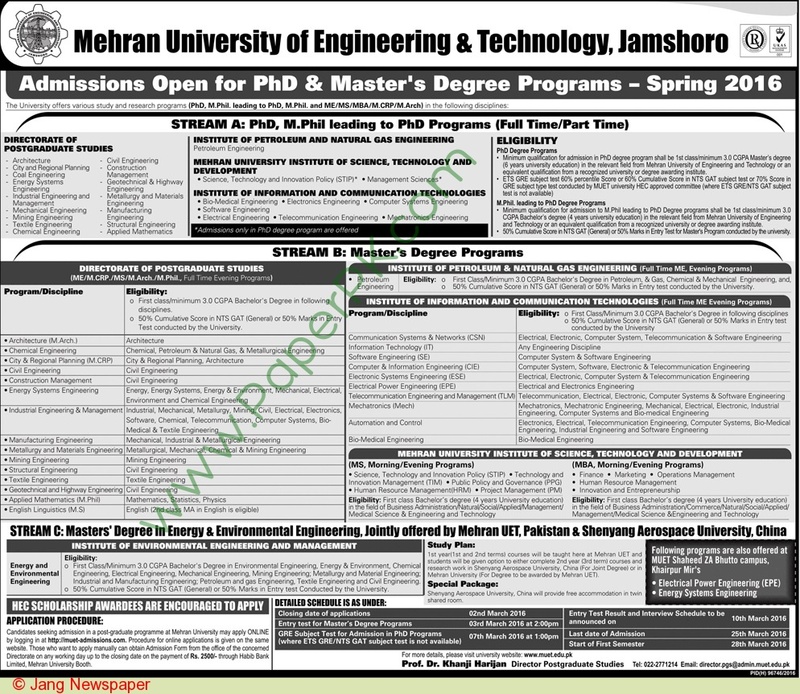 universities Master's degree in energy and environmental engineering is jointly offered by Mehran UET, Pakistan & Shenyang Aerospace University China. in this program students have the option to study 2nd year (3rd semester/term) in China. Some programs are also offered at MUET Khairpur Mir's Campus. First class/minimum 3.0 CGPA bachelors degree in relevant disciplines with 50% commutative score in NTS GAT or 50% marks in university conducted test. Minimum qualification for admission in PhD degree program shall be 1st class or minimum 3.0 CGPA Masters degree (6 years university education) from any recognized and degree awarding institute. with 60% commutative score in NTS GAT or 70% marks in GRE subject type test in university conducted test.